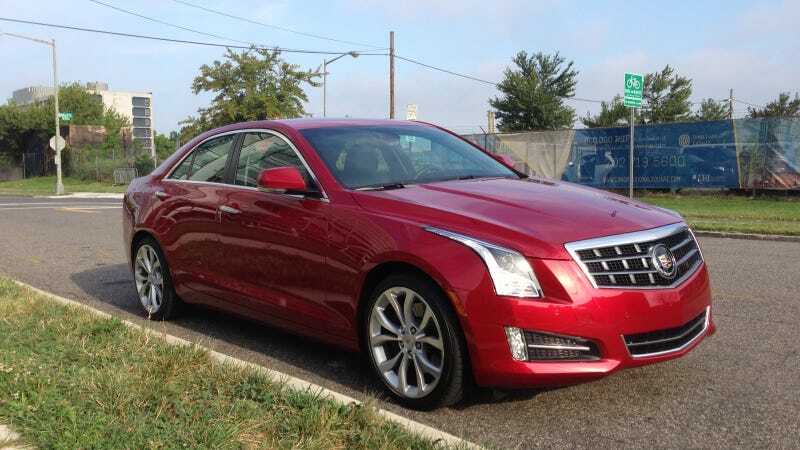 This would be a 2013 Cadillac ATS with a 3.6-liter V6 and automatic transmission. Yes, it's as good as you have heard. I'm not sure if we'll end up writing about it since Matt already reviewed it, but I'll try and figure something out. I'm bringing it to the Cars and Coffee at Katie's in Great Falls, Virginia tomorrow morning, at the very least. I plan on seeing what it can do on some back roads this weekend too. Things I like: Plenty of thrust from the 321 horsepower, 275 lb-ft V6 (slamming your foot down will easily spin the tires); agile handling that's nearly as tail-happy as a BRZ; decent automatic with paddle-shifters; very fun to drive with a sporting character. Things I don't like: Cadillac's CUE infotainment system is laggy and unintuitive; haptic buttonless center panel is extremely wonky (Buttons, people! Buttons are your friends! ); interior is very nice, but I'm not sure it's on par with its $53,295 price tag. So far I'm pleased. It's been a blast, and I'm looking forward to seeing what else it can do. If you have any questions, feel free to post them in the comments and I'll answer them as best I can.